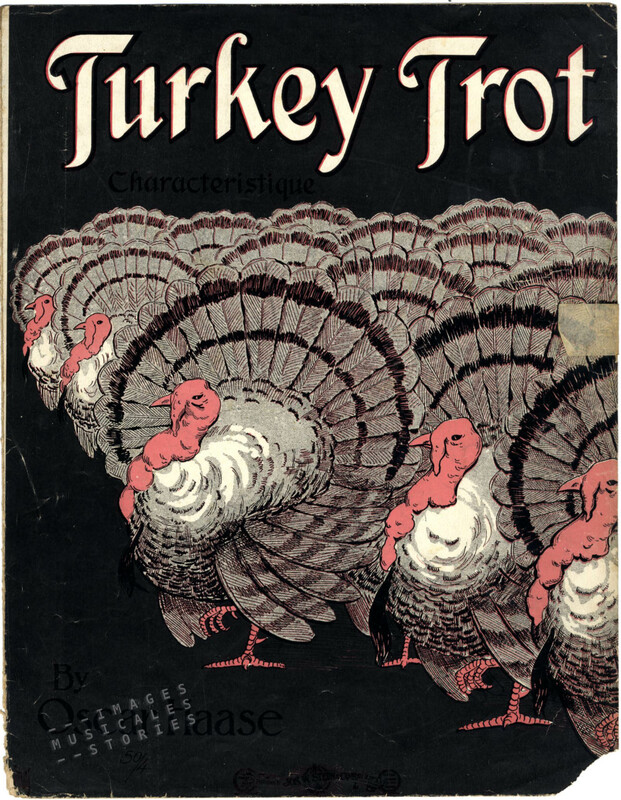 ‘Turkey Trot’ by Oscar Haase, published by Jos W. Stern & Co (New-York, 1908, s.d. ); unknown illustrator. In a time of dirty dancing with sexually explicit twerking, daggering and grinding, it is hard to imagine that these lame turkeys irked the guardians of morality. But they did! In the early 1900s a number of animal dances became very popular. They were inspired by animals demeanour, knew a fast ragtime rhythm and shocked society. 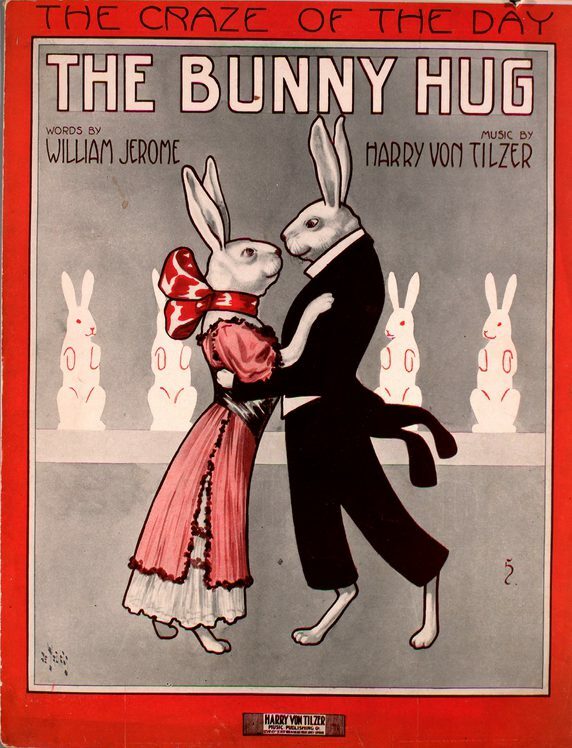 The three most provocative dances were the Turkey Trot, the Grizzly Bear and the Bunny Hug. 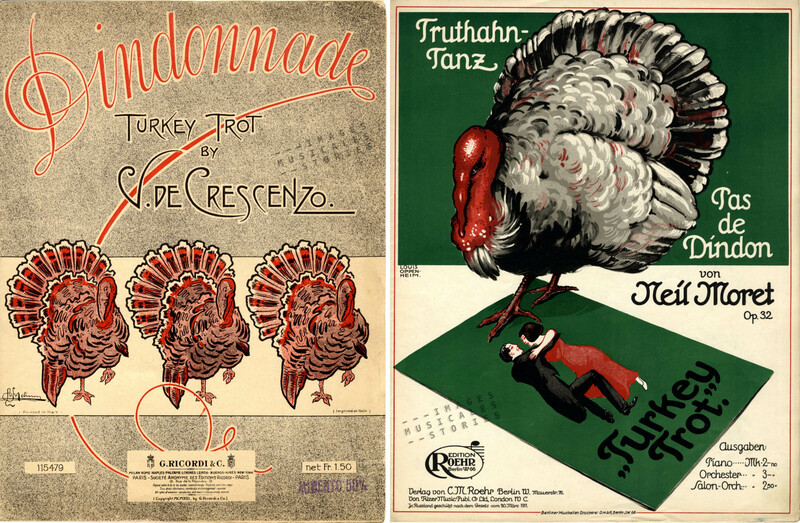 The oldest of these dances in our sheet music collection is the Turkey Trot by Oscar Haase from 1908. But initially it had no great success: the craze of animal dancing started a few years later, originally from the saloons and dance halls of San Francisco. 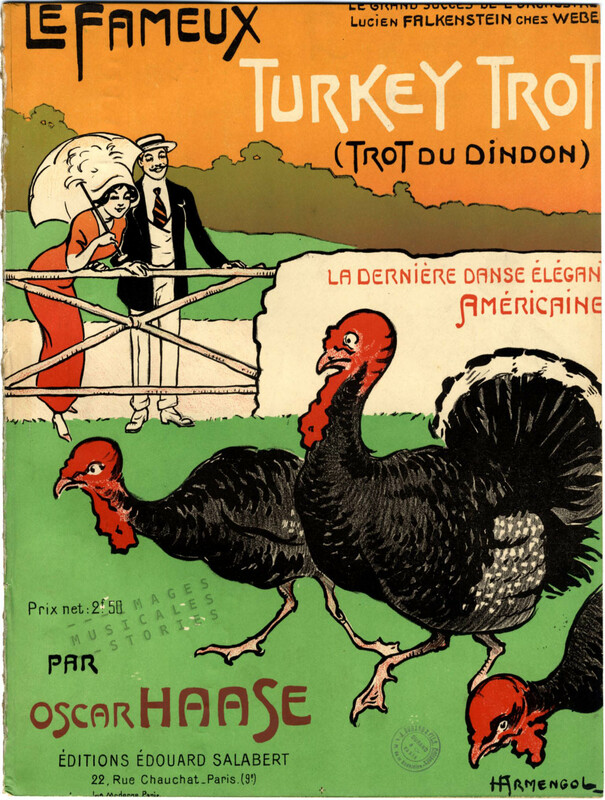 The same ‘Turkey Trot’ by Oscar Haase, published in France by Edouard Salabert (Paris, 1908). Henri Armengol illustrated this cover, which was probably published between 1911 and 1912. Together with the syncopated beats of the ragtime, the animal trots became very popular between 1910 and 1913 in the United States but also in Europe. In France, Edouard Salabert published Oscar Haase’s Turkey Trot as la dernière danse élégante Américaine (the newest elegant American dance). Although the year of copyright (1908) is printed on the sheet music we can realistically date it to 1911 or 1912 because those are the only years that Henri Armengol illustrated for Salabert. Left: ‘Dindonnade’ by de Crescenzo, published by Ricordi (Paris, 1913). Right: ‘Truthahn Tanz’ by Neil Moret, published by Roehr (Berlin, 1912) and illustrated by Louis Oppenheimer. The most popular of these fads in Europe was The Grizzly Bear, known respectively as the Bärentrot (Germany) or the Pas de L’Ours (France). Left: ‘The Grizzly Bear’ by George Botsford, published by Salabert (Paris, 1910) and illustrated by John Frew. 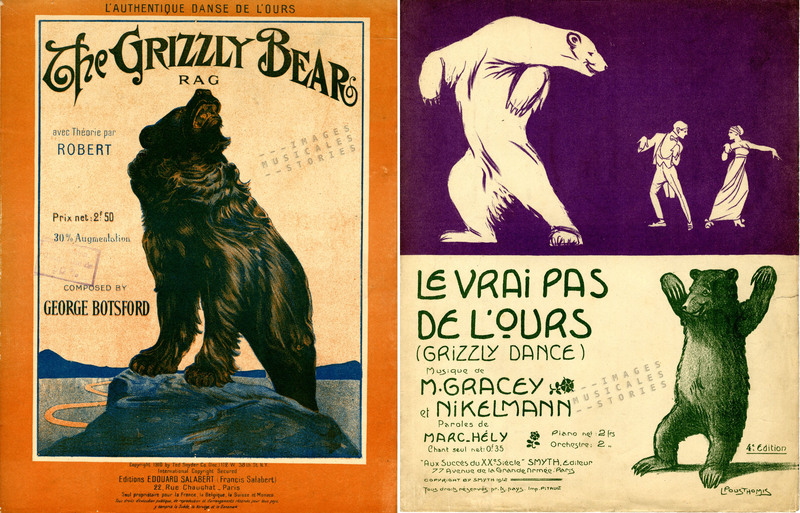 Right: ‘Le vrai pas de l’ours’ by Gracey & Nikelmann, published by Smyth (Paris, 1912) and illustrated by Leon Pousthoumis. Left: ‘The Black Bear Dance’ by Willy Michels, published by E. De Saedeleer & E. Possoz (Brussels s.d.) and illustrated by Valéry. Middle: ‘Le Pas de l’Ours’ by Alteirac, published by Jean Péheu (Paris, 1912) ans illustrated by Pousthomis. Right: ‘Bärentrot’ by Max Oscheit, published by Alfred Lehman (Leipzig, s.d.) and illustrated by Telemann. Bye-bye Belle Époque! These new, fresh and daring dances were a sign of modern times, the waltz was passé. They were easy to learn for people who had no time for dancing schools. They were just a One-Step (a kind of walk) with some special routines, embellishments and humorous gestures (flapping elbows, outstretching paws, kicking or hopping). No special music was required as long as it was syncopated. One couple could dance the Grizzly Bear while another would do the Turkey Trot. According to Walter Nelson “All would share a dance floor and dance to the same music as everyone walked or slid or hopped forward, backward, or in a circle, and assumed a variety of postures – and each would be as wild or as silly or as dignified as their own tastes dictated.” In Paris, Salabert published Irving Berlin’s famous ‘Alexander’s Ragtime Band’ as Le Célèbre Pas de l’Ours. 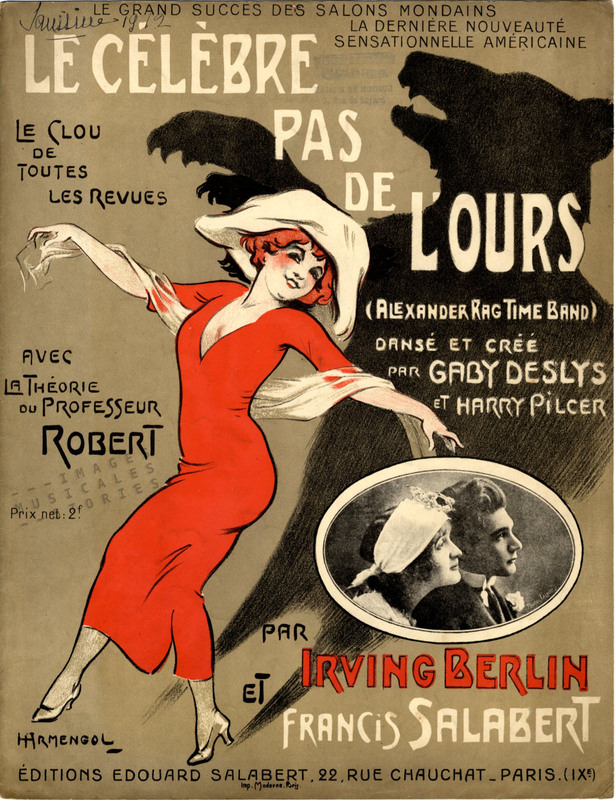 ‘Le célèbre pas de l’ours’ by Irving Berlin, adaptation by Francis Salabert, published by Salabert (Paris, 1912) and illustrated by Armengol. But these animal dances became increasingly disagreeable to the taste police. With dance partners hugging, moving too close and being far too intimate, the dances were labelled ‘offensive to modesty and dangerous to purity’. According to one cleric the Turkey Trot was a ‘gait to Hell’. Another one told Catholic parents to ‘shield their children from the slimy touch of moral lepers’ (meaning young men and women who engage in these infamous dances). Many European religious leaders also attacked the modern dances, which even resulted in a Papal ban. Mind you, the Pope did not condemn all dances, indeed some were blessed (like the Furlana). Chaste dance halls soon forbid turkey trotting, bunny hugging and bear trotting. A number of colleges adapted a strict rule that dance partners should be separated by at least six inches. Austere dance monitors enforced these rules on the dance floor. Worse still, people were arrested and had to defend themselves in court for dancing one or other animal trot. In several places in the United States the police threatened to shut down every dance hall where the Bunny Hug or Turkey Trot was performed. Elsewhere, a police officer had to be present at all times to prevent the dancers to hug each other. Furthermore a lot of medical complaints were attributed to the trotting. And finally, ragtime was considered a madness and a threat to mental health. But you can judge for yourself: a surviving reel from 1913 shows how the Grizzly Bear was danced. Cute isn’t it? In Downton Abbey the footman Thomas learns the kitchen maid Daisy how to dance the Grizzly Bear. Here and there balls were called off. 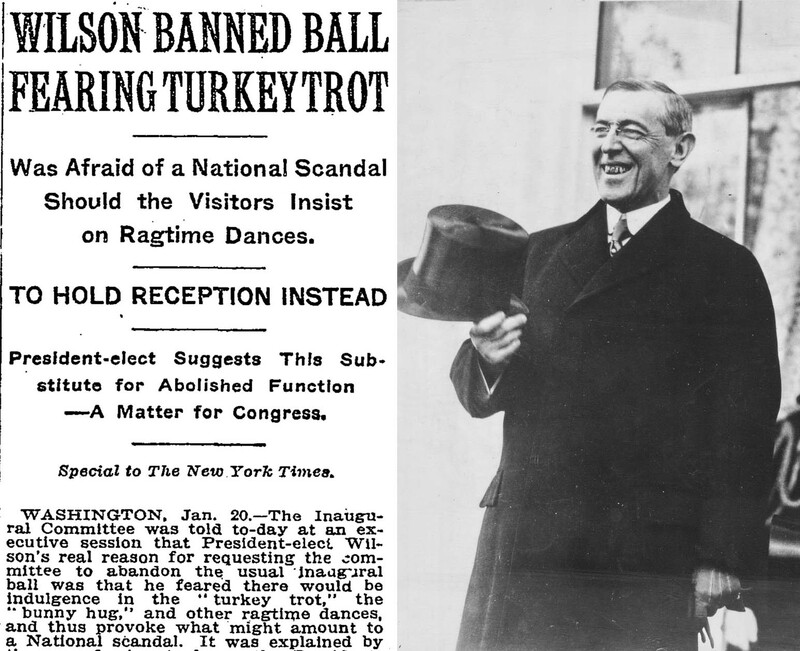 The most famous one was president Wilson’s inaugural ball in 1913. Wilson, a man of deep religious faith, replaced the ball by a reception. Allegedly, he feared that in spite of all warnings and prohibitions, young people would do the scandalous trots anyway, thus provoking a national disgrace. Left: The New York Times, January 21, 1913. Right: President-elect Wilson prior to the inauguration ceremonies, March 4, 1913. 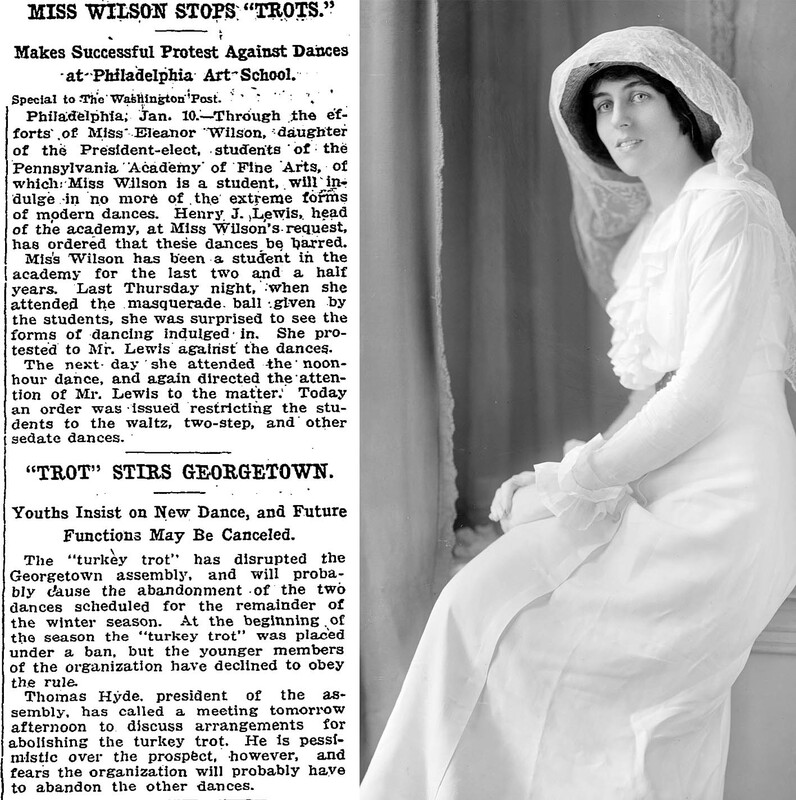 Wilson’s youngest daughter, Eleanor, requested that the academy where she was attending school would ban inappropriate forms of modern dance. Her appeal was granted: since then students at her art-school were only allowed to sedately dance the waltz or the two-step. Left: The Washington Post, Januari 11, 1913. Right: Eleanor Wilson (Library of Congress, Harris & Ewing Collection). 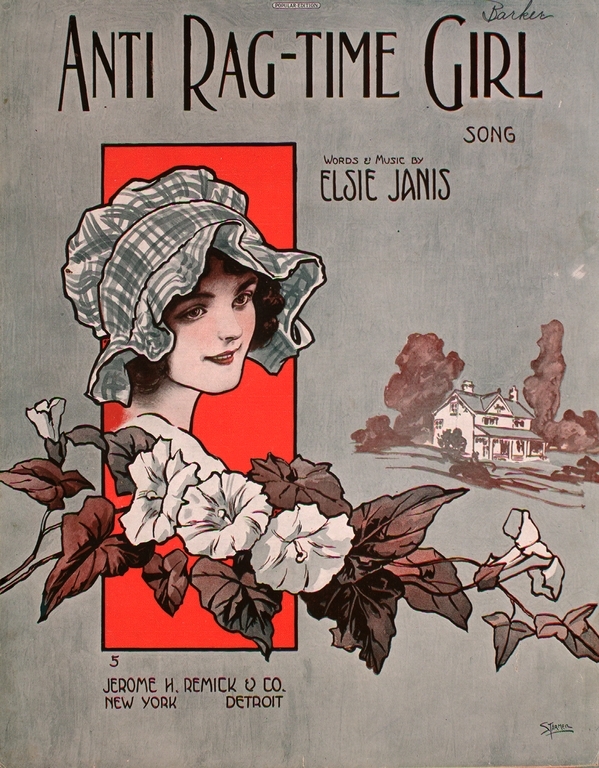 In 1913 one of the staunchest defenders of modern dancing, the female composer Elsie Janis, wrote the obvious ironic song ‘Anti Rag-Time Girl’, enumerating all the offensive dances that the girl in question refuses to participate in. For the songs sheet music cover, the Starmer brothers drew the portrait of a demure girl, not unlike the prudish Eleanor Wilson…. By 1914 the Bunny Hug, Turkey Trot and Grizzly Bear were out of fashion. And the anti-dance league busied itself in tackling other dances, like the Maxixe or the Tango. Of all the animal trots, only the foxtrot survived and became the most popular dance of the entire first half of the twentieth century. But that’s another story. Doris Day can finish this small history by dancing the Turkey Trot in the 1951 film ‘On Moonlight Bay’. If America’s sweetheart can dance the Turkey Trot, then the puritan interdict is lifted: yeeha! wist U dat Nijvel NIET alleen wereldbekend was met de” tart à l’djot”, maar ook dankzij de dindons de Ronquières?